Private browsing mode is intended to protect your privacy from other users of your computer. 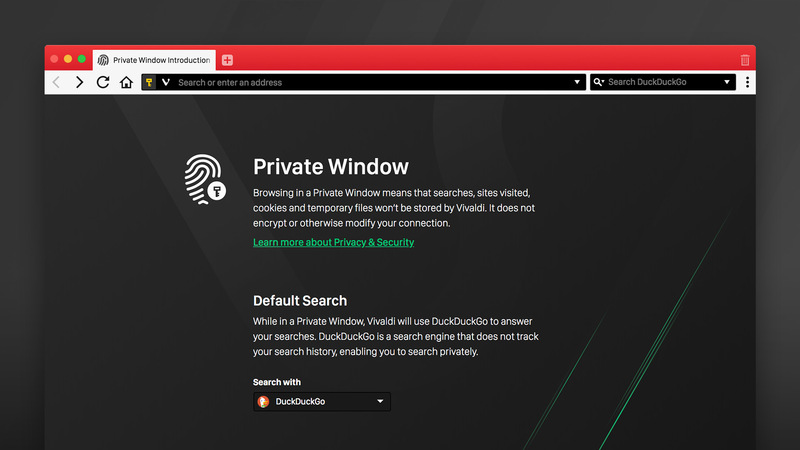 When you browse using a Private Window, Vivaldi will minimize what is stored locally on your computer so that very few traces are left of what you were browsing once you close all private browsing windows. Using a Private Window does not encrypt or otherwise modify your connection. All private windows share the same session while they are open, so you need to close all of them to cause the session data to be deleted. A Private Window in Vivaldi does not use the same cookie store or cache as for regular browsing. It does not store the history of addresses that you visit. It tries – as much as possible – to only store website cache files in memory instead of on disk, so that disk scanning tools will not find residual traces of the files. If you have forgotten to use private browsing mode, you can select Clear Private Data from the Tools menu to either delete all your browsing history, or just the history for a selected amount of time. Of course, this cannot remove traces from the disk so disk scanning tools may be able to find traces. Read more about private browsing on our Team Blog.